My memories of my childhood, from my childhood. Reetesh’s Old Memoirs (ROM) will be a series that archives my auto-biographical posts from my GameSpot community days. It has been close to 10 years since I started writing blog posts at GameSpot about my gaming (life) history, and I decided it’s high time I archived it. With most of my personal history on the internet fading away as portals decide to delete forum and blog posts while transitioning to newer software, I started thinking of maintaining a personal record of everything, in my own personal space. I will be re-reading all of these for the time since I posted them. It will be a nice personal exercise too, as I see how my personality and writing style changed over the years. I will make careful and minimal changes to the original post, so that it stays true to the original character I wrote it in. Will also link to the original post at GameSpot so that you can read it in its original form. In its later stage, the series was selected by GameSpot community staff to be highlighted in the community “Soap Box” whenever I had an entry. This meant it was showcased on GameSpot’s home page. There were around 50 comments on every post, and it brought up interesting discussions every time I posted; made many friends that way too. All comments were purged in the recent GameSpot transitions, which was also one of the main motivations to start moving it here. Each post in the series recaps the experiences I had with a particular generation of games in my life. A Generation is a chronological division based on major shifts in my personal timeline. Posts are mostly about expressing how much games defined my childhood and shaped my future. The first post in the series talks about the Atari 2600, I did not have any idea of the games’ names when I posted it, friends who saw that post later informed of the names. I grew up (and still exist) in a place where the only thing that people (90%) know when it comes video games is 8-Bit video games. No one even plays video games here (at least as much as I do) and no one even knows what a PLAYSTATION is. In the Beginning years, I and my brother were the only people who were so much interested in video games but since the past two years gamers are increase here too( though only PC gamers). Anyone who owns a PS2 or any other current gen console, keeps it for show and to says that they bought it for big $$, they play them with the first set of games that they got when they bought it and rarely buy new games. So this is the place where I live. I would like to start with how I got so much interested in games, and how much they mean to me. I had a video game console at home even before I was born. It was an Atari 2600 that my father bought for my elder brother. It was a special one since it had 200 games built-in. I can say that I started playing games from the age when I was able to see things and co-ordinate my hands and really play (age 3-4). We had two joysticks for that, and my brother would always set it up with the TV and show me how to play. I still remember the first game in the system, it was some aeroplane thing with refueling stations through which we had to go to not fall off. Then there was the escalator and police-thief game. When we turned on the system the games would continuously scroll and we had to pull down a sliding button (Reset) to make it stop at that game. Selecting the game itself was a challenging thing. The games that I liked very much were the see-saw (teeter-totter) game where the other person jumps and we had to make him fall in the other side of the plank, and so on and so forth. 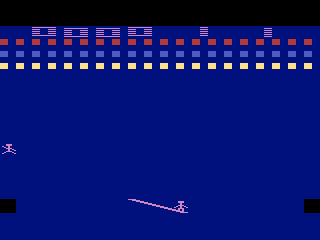 Then there was the Bowling game (featured in one of the Button Mashing episodes), the Tennis game and the game that we called TOM BOY, which actually we found out last year is Pitfall. Golf? More like the Block-and-dot game! like “NO! THE JOYSTICK BROKE” and I was like “NO! IT DIDN’T HIT IT PROPERLY” (what can I say, I was a little boy :P) and when my brother played, he pulled it back slow and hit the ball and it went way near the hole, and I was amazed how he did that without hitting it hard. 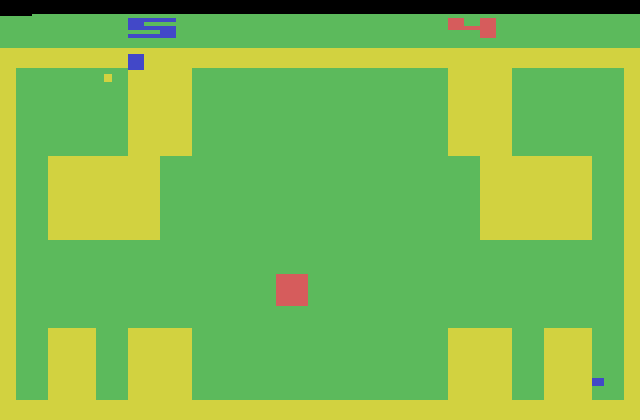 This was our Atari2600 Era. I and my brother played in till the last joystick coming up in the next entry will be our great intro to 8-BIT GLORY..
Thanx for reading my journal’s first entry. I finally got my summer break (7 days ) and am going to fulfill all the things that I wanted to do in the forums, and can anyone help me in naming those games so that I can add them to my collection:?